The Lightning came out looking every bit like the juggernaut they are in the game’s first 18 minutes, filling the arena with fireworks by scoring a trio of pretty goals. But the heavy favorites got complacent during the first intermission, and the desperate Blue Jackets pounced. In the second, they got one back thanks to Nick Foligno. 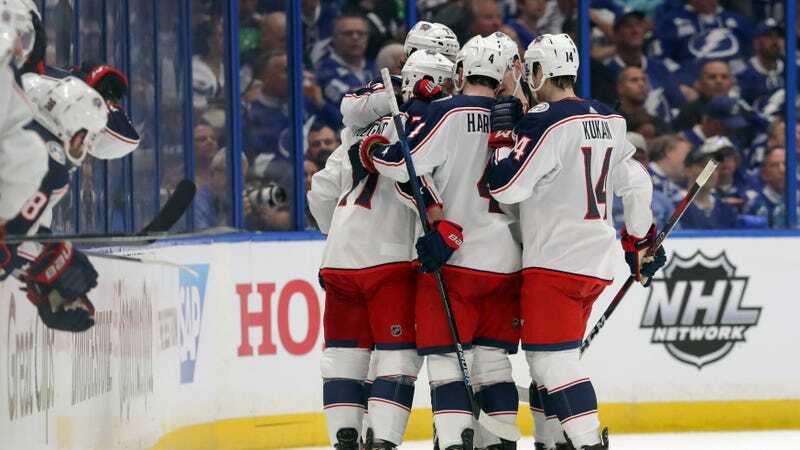 And then in the third, in the span of about six minutes, they got the three others that they needed, with unlikely scorer Seth Jones delivering the knockout blow with 5:55 to play. It sure didn’t look like it a couple hours ago, but suddenly we got a dang series. Hockey is a weird sport, and there’s certainly precedent for Presidents’ Trophy winners to lose in the first round. But the Jackets were such monumental underdogs that it was easy to write off the whole series as soon as Yanni Gourde made it 3-0. Instead, Columbus has to be seen as a legit threat, at least for another week.